I promised Karen and her Husband John I would try and stay up to date with her journey through the Channel Islands, off the coast of California. Karen and I never got a chance to catch up yesterday as planned, so I am doing my best to find info from various other sources, until we can communicate directly. The coverage below is from a couple of different areas, including ABC News in Los Angeles, and her own personal Twitter Feed, @karenwrenn. As soon as I hear from Karen or John, I will update this page with the latest news and info. LONG BEACH, Calif. (KABC) — A Long Beach woman is set to take off Monday on what could be a record-breaking adventure. Karen Wrenn, 37, is attempting to paddle between all eight of the Channel Islands consecutively. 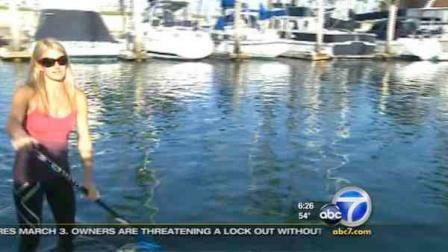 She was scheduled to paddle out Monday morning to begin her six-day, 150-mile journey. Wrenn is a champion stand-up paddler and a mother of two. Thanks for all the support! Your site is great! I posted your coverage on my personal site. See you out on the water! Karen, you are welcome! You and people like you are the inspiration for this site. Keep paddling.